^ We welcome any requests, and do take them into consideration when we put together our schedule. We can't get to all of them right away, but we will get to all of them! Awsome! Perhaps when you get enought material, have you considered the Log Flume? Other than that, I'm excited because another Spotlight comes out tomorrow! With some of these spotlights it's feast or famine...there is either so little (or at least so little in our collection right now) that the spotlight would be really small, or there is so much that turning it into a spotlight is a MAJOR undertaking. Log Flume is a perfect example of a HUGE spotlight because we have so many pictures and it's difficult to figure out just how to present them all effectively, plus we keep getting more and more. Rolling Thunder and GASM were also examples of these. Another problem is what do we do when we keep getting more information and pictures for a spotlight? We have to keep revising the pages. Right now I think we'll mainly be concentrating on a couple of the small spotlights with some of them building up to major spotlights (whole sections of the park), but there may be a biggie or two coming in the next few weeks. The newer Spotlights usually require less research but are often much larger with videos, renderings, simulations, press releases, etc. How About an Update on Fright Fest in the Halloween Area? A Planned but Never Built? Would you consider the sponser thing I suggested? ^ All good ideas! We will probably have an update to the Halloween Events page this fall as part of the 20th Anniversary of Fright Fest. We would love to do another Attractions Planned But Never Built Spotlight, but we need to do additional research before we can release the next one. Watch for the Sponsors Spotlight in the upcoming months. It is a great idea! In the meantime, tomorrow is the 26th! Spotlights are on-deck! Here's Hoping for a Golden Kingdom/Balin's Jungleland Spotlight. Our next Spotlight will be rolled out later today. Finishing touches are still being done! 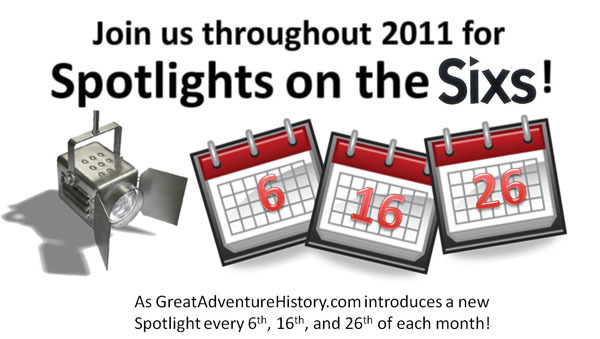 So, by the calendar we should have introduced 8 new Spotlights and/or features so far this year with our new Spotlights on the Six's campaign. Since the first of the year, we have actually introduced 18 new Spotlights/features! How cool is that! And I think people are REALLY going to like this weeks! Here's Hoping for a Themed Area Spotlight. We have a themed area Spotlight page in the works as we speak! I'm just finishing up the next two spotlights for the 6th and the 16th. We'll be away for a week or two and we'll be crazy busy with the opening of Green Lantern coming up so I'm putting the spotlights and newsletters together in advance! The number of Spotlights we just rolled out! Wow, I Feel like a Jerk. In most cases we really don't know why they were removed. There's really no official word on why most attractions are removed. We know that Wild Flower and Jumbo Jet were leased with the option to buy which the park apparently didn't exercise (just like the first Enterprise). We assume the same was true with Super Cat. With Skooter and Tilt-A-Whirl we assume it was a case of eliminating excess capacity at a time when the park was doing very poorly attendance wise. Thank you! Thank you! Thank you! I've been waiting for this spotlight for two years. This IS what helped shape GA back in the day. ^ You will just love it when we pull all these together and do our Spotlight on the Fun Fair section of the park! Watch for it soon!